Chicken cacciatora is a simple dish that yields impressive results. The preparation of this dish takes minutes, but the magic happens over hours as the chicken marinates in wine, before bubbling away in a low oven. 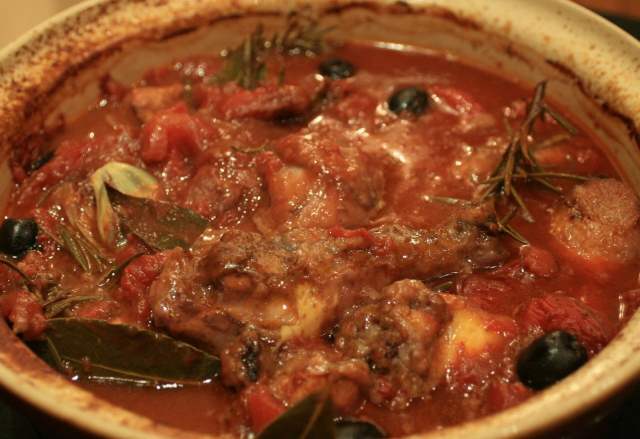 The end result is tender chicken in a deep and savoury sauce rich with wine and tomato. Authentic, rustic Italian food. First, joint a free-range or organic chicken into eight pieces and place them in a large bowl. The chicken’s back will be left over, as will the wing tips and other miscellaneous pieces. Freeze these for stock making purposes later. To the chicken, add a couple of big sprigs of rosemary, each eight or nine inches long, along with at least eight bay leaves, fresh or dried, and a crushed clove of garlic. Don’t bother to peel the garlic, just smack it hard with the side of a heavy knife to break it open a little so that it can release it’s flavour. Finally, add half a bottle of Chianti. Remember that you only need half the bottle, and the other half must be disposed of in some way, so make sure that the wine is of a reasonable, drinkable quality. Leave the chicken in the fridge to marinade for a couple of hours, or ideally overnight. This is a vital stage, allowing time for the wine to flavour the chicken completely, and for the herbs and garlic to infuse the wine. When you’re ready to cook, scoop the chicken pieces out of the marinade and dry them on some kitchen towels. Place the chicken into a plastic bag with a couple of tablespoons of flour and some salt and pepper and shake until the chicken is well coated. Dust off any excess flour and brown the chicken in olive oil, in batches, in a large ovenproof pan. After the chicken is browned, add six anchovy fillets and a sliced clove of garlic to the pan, on a medium heat. Fry until the garlic takes some colour and the anchovies start to break up. Add two cans of good tomatoes, breaking them up a little with a wooden spoon, and a good handful of black olives. The anchovies serve to intensify the flavour of the sauce and give it a salty background that isn’t at all fishy. The olives are just delicious. Finally, add the reserved marinade, rosemary, bay leaves and all. Season well. Bring almost to a boil. Add the chicken pieces and arrange so that they’re submerged in the sauce. Put a lid on the pan and cook in the oven for an hour and a half at about 180C. With about ten or fifteen minutes to go, take the lid off the pan and allow the top of the dish to brown a little. Taste, and adjust the seasoning before serving. Serve with any type of green vegetable, or a salad. We had some chard with this, along with crusty bread and the rest of the Chianti. There will be plenty of sauce left over. The sauce is excellent the following day with pasta…two meals in one. Very frugal. , which is an excellent introduction to Italian cooking and well worth looking out for.